One of my favorite parts of the holiday season is getting my family and friend’s holiday card in the mail. It’s always great reading about what people have been up to, but nothing beats seeing the happiness they share through their photos. That’s why to me the best cards are holiday photo cards. One of the biggest challenges to the holiday photo cards is to get your family photo taken which is why we’ve come up with some tips that will hopefully save you time and ensure your family photo turns out perfect. Some of the best holiday photo cards are taken with a backdrop that’s meaningful to the family, whether that’s your favorite mountain slopes, waterfront or even a popular city-scape. Or, it could be as simple as some trees in the background, which when taken this time of year in autumn can make for some really beautiful photos. Too many times families will try to dress up in something that don’t typically wear because they think it’s the right thing to do for a “formal” picture. The reality is most people look how they feel, so dress comfortably. You’re going to see the smiles come much more naturally, especially with younger kids. They say that pictures last a lifetime, and since the holiday photo is often the only family photo taken in a year it’s not a bad idea to consider hiring a professional. You can typically find a local photographer for a reasonable price, especially for a short single location shoot. When it comes to making a decision you should always, A) ask your friends or family for a personal referral, B) review the photographer’s portfolio online, and C) look for peer based reviews on sites like Angie’s List, Yelp, etc. 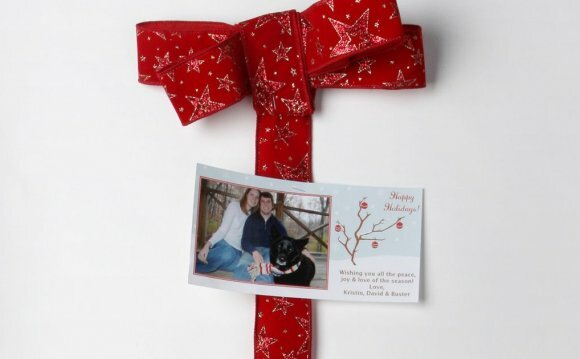 Check out our online holiday photo cards by clicking below. There are several different formats available from single photo postcards, multi-photo postcards and greeting cards. All of our holiday photo cards are full-color and include same day turnaround, but don’t wait too long because the holidays are right around the corner. Call one of our VIP Support Reps for a one-on-one walk through your choices, 800-260-5887.